For today's post, I wanted to share something a little different. I've been wanting to share little glimpses of what my daily life looks like, and in this case, I wanted to share a 'what I eat in a day' post. I love watching these kinds of videos on Youtube and finally decided I should try it out in a blog post. Obviously what I eat changes from day to day, specifically dinner. Here is what was on my dinner menu this day! I'm the type of person who needs to have sort of breakfast when I get up in the morning. It can be something filling like pancakes or something as light as a granola bar. Just as long as I get something in me I'm good, because if I don't I start feeling weak and nauseous. 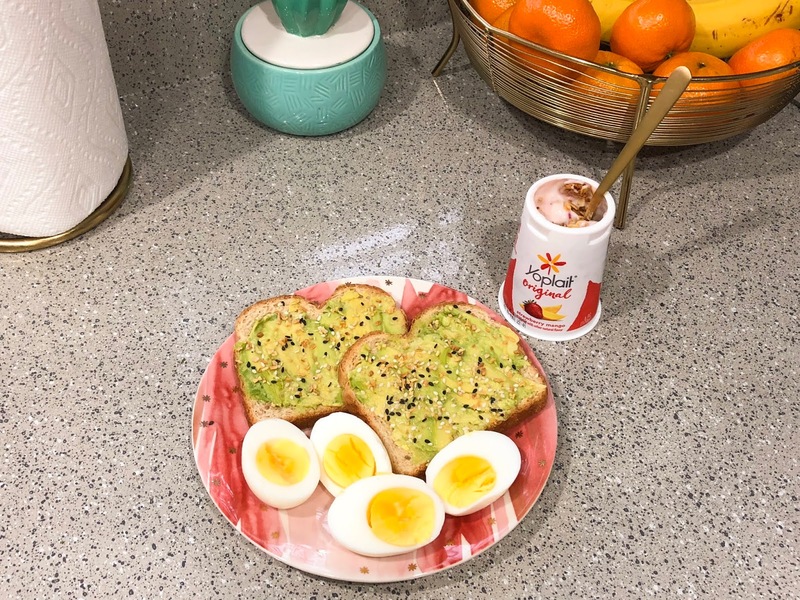 Lately, this is what my breakfast has been looking like; two pieces of whole wheat toast spread with avocado among two hard boiled eggs, with either a side of fresh fruits or yogurt with granola. 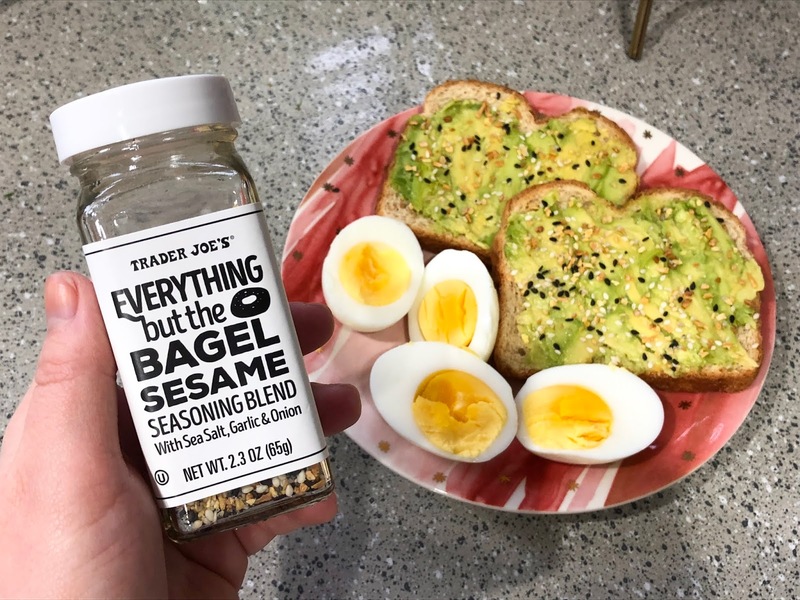 I have been obsessed with having avocado toast and to make it even better I sprinkle some Everything But The Bagel Sesame seasoning from Trader Joe's. This seasoning is so good! I've owned it for a couple of months now and barely started using it at the end of May. I've been eating this almost every day since. Besides my toast, I have two hard-boiled eggs. There are so many amazing benefits to eating two eggs a day and not just from the protein they offer. This combo does an incredible job and keeping me full up until lunchtime. As I mentioned I usually try to have a side of fresh fruits with my breakfast every morning. I'll chop up about five to six strawberries and I'll also add a bunch of raspberries in a small bowl. That's my typical bowl of fruits, but again, this changes depending on what fruits I have in stock at the house. Some of my favorites are strawberries, raspberries, tangerines, bananas, and as of recently kiwi and watermelon. This morning I went with yogurt and granola. For my lunch, sandwiches are my go-to! I love having a filling sandwich so I like to add mayo, spinach, avocado, cheese, ham, and onions. If I didn't have fruits for breakfast I will make sure to include some in my lunch like a couple of tangerines. Some days I will also have a side of cheese, and occasionally some chips. Most of the time if I eat this way I can get away without needing a snack, but on days that I do find myself urging for a little something and it's not quite dinner time yet, I typically grab some pretzels to dip in some hummus or Nutella if I'm craving something a little sweet. 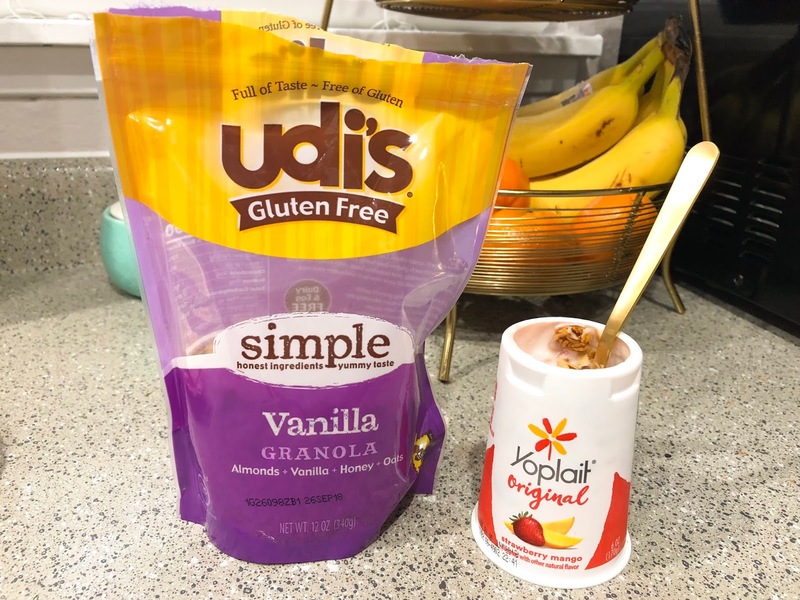 Another favorite snack of mine is yogurt with granola since it's nice and filling. I look forward the most to dinner time because this is when I like to do the most for our meals. On this day I made one of Rudy's favorites, my yummy chicken burritos! I like to marinate my chicken in one of two ways. First, is seasoning the chicken very lightly with garlic salt and then I add lemon juice. The second way is by adding some soy sauce and juice of a whole lime. I usually let this marinate overnight. I like to grill my chicken and serve it on whole wheat tortillas. In my burritos, toppings I add are spinach, chicken, beans (black is my favorite in this recipe), shredded cheese, avocado, pico de gallo, and any hot sauce I have on hand. This is definitely one of my favorite meals that I enjoy to make and eat! It's healthy, yummy, and so easy to put together. It is so satisfying and filling. I have a major sweet tooth and usually need a little something sweet to end my day especially after eating well. I like to look at it as a small reward. This is something that always changes depending on what I'm craving and what we have in the pantry. I wanted to say that I make sure I portion the intake of sweets. For example, if I eat an oreo I limit myself to no more than three. If I feel like a donut I will make sure that instead of having the entire thing to split half with Rudy. It's all about portioning your intake. I try to keep my meals on the healthier side, but I'm sure there is still room for some improvements. I'm pretty satisfied with how I eat for the most part (I still have a cheat day once in a while) and little by little I'm trying to make changes to better options. Let me know how you liked this post. I would love to begin sharing recipes on my blog if that is something any of you are interested in. This was also a nice small intro of things I make in my kitchen because my next post will finally be on my next series; My Apartment Tour. Kicking off with my kitchen tour! Hi, friend!!! I love this post. I am always watching these videos on YouTube, too! I think we have similar taste because all your meals look so yummy! Avocado toast is my fav. :) I would love it if you shared your recipes! Thanks so much for that feedback Madison. I will definitely make sure to include recipes in future posts! I love this post! All the food and snacks look delicious! You should really share more recipes, I miss your recipe posts. Thank you, I hope to put out some recipe posts in the future!